Perennial in Zones 8 to 12. Grown as an annual in the temperate north, 80 days to maturity. (Egyptian Bean, Hyacinth Bean, Bonavist Bean) Native to tropical Africa, vining to 30 feet. Excellent nitrogen fixer, also making edible pods (toxic when raw, must be cooked before consumption) and very pretty flowers, also edible. 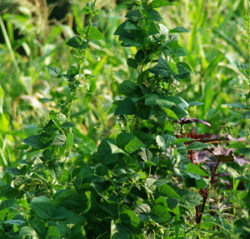 Plant prefers full sun, rich, well-drained soil and a trellis. Soak seed overnight and sow directly in the garden in the spring, or get an early start in the greenhouse. Direct seed or sow in large pots. Germ is in 20 days at 70° F.
is this really edible as a mature bean? I have seen mixed reviews. When picked tiny and stir fried they are delicious but most sites say the bean itself is inedible unless cooked twice? Thanks for contacting, and I think this is a worthwhile subject, too. Hyacinth Beans (Dolichos lablab) contain toxic cyanogenic compounds that are rendered relatively non-toxic by thorough cooking. I suppose that cooking in 2 waters would even further detoxify. After all, my wife and I cook regular beans that way which we think improved digestibility. In any case I like Hyacinth beans because they are pretty in a way that regular Phaseolus vulgaris can never hope to be. 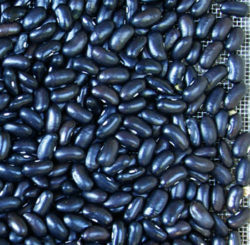 For eating, try Blue Lake Bush Beans. Nobody has improved on that.